When you live in a city fueled by a passion for hockey, it’s no surprise many children enjoy getting onto the ice. Paul Hamm, 11, loves watching the Winnipeg Jets. “He is a hockey nut,” said Melanie Hamm, Paul’s mom. Thanks to the Society for Manitobans with Disabilities (SMD) Paul is able to score goals of his own on The Sledgehammers. 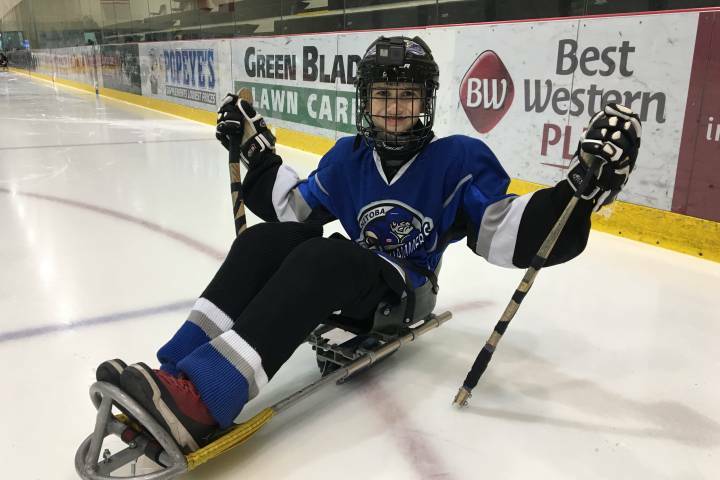 “When he (Paul) started school, SMD became a bigger part of our lives in that we started sledge hockey and that is the beginning of a beautiful story,” Melanie said. Paul has been playing sledge hockey for the past six years. The sport has helped him learn new skills, make new friends, travel to tournaments in the United States and boost his confidence. Standing tall on a dresser in Paul’s bedroom is a large trophy his team won at the 2018 International Sledge Hockey Tournament in Minneapolis. Kevin Hamm helps coach his son’s team. And loves watching Paul grow in the sport. “The kids love being on the ice. It’s very good for their morale,” Kevin said. An experience Paul’s parents didn’t know would be possible when their youngest of three boys was born. Trauma at birth left Paul fighting for his life. He has cerebral palsy which affects his speech and motor skills. He has ataxia, which makes his hands shaky, he has had adaptive prosthetics for his legs to keep his feet straight. With adaptive equipment and a drive that never quits, Paul gets involved in all kinds of activities. “Watching his determination and how strong he is, he’s probably the strongest kid I’ve met in my life. He doesn’t let anything slow him down,” Melanie said. From making his own music using a digital keyboard and Garage Band software to playing video games with his two older brothers, Paul has a lot on the go. He was recently named the 2019-2020 Youth Ambassador for the Society for Manitobans with Disabilities, which means he’ll be sharing his story at various events. His main message is about seeing people’s abilities. “People with special needs can do as much things as normal people can do. They can play hockey on sleds, they can play video games, they can be whatever they want basically,” said Paul. The Hamm’s are excited to give back to an organization that has offered their family so much. “SMD has been there for us to help us understand maybe what our next steps will be so in terms of forecasting what he’s going to need in the future and helping us with what he needs today,” Kevin said. “This role with SMD is going to let everybody know what a great kid he is and how people should get involved with SMD because there are so many more great kids out there that need a chance to shine,” Melanie said.